Bonrix Track & Trace GPS System, vehicle and Fleet tRealtime Tracking, Ahmedabad, Gujarat, India. A GPS tracking unit is a device that uses the Global Positioning System to determine the precise location of a vehicle, person, or other asset to which it is attached and to record the position of the asset at regular intervals. The recorded location data can be stored within the tracking unit, or it may be transmitted to a central location data base, or internet-connected computer, using a Cellular ( GPRS), Radio, or Satellite modem embedded in the unit. This allows the asset's location to be displayed against a map backdrop either in real-time or when analysing the track later, using customized software. You can easily track your person or object world wide. Our application can provide street level map to seen your object so that you can get detail data. This software is useful to any type of organization or company they want to monitor movable object. 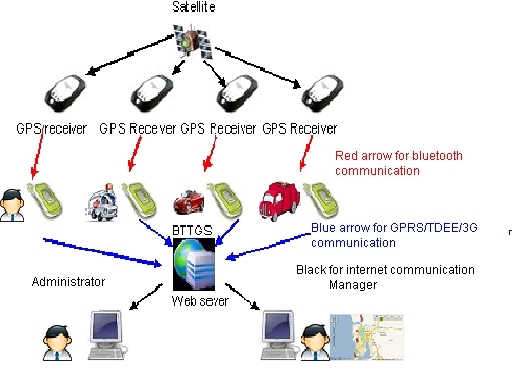 The Bonrix Track & Trace GPS System - a Unique and Innovative Location Based Services (LBS) is developed as web application software that provide clear view of persons or vehicles that are using by any organization or company for their work. BTTGS has been developed as web-base and mobile phone software package that provide flexible view of there person or vehicles in map that on website. In BTTGS we are providing extra facility like if person is not in connected area so it can't send data to sever in that case phone is stored data of location and update sever when persons or vehicles is in connected environment. 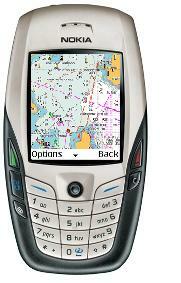 GPS devices detect your object and send that longitude and latitude to the phone via Bluetooth link. Phones will receive that data and send that data to sever via GPRS/TDEE/3G and using that data through internet connection you will able to see your object on website. Our website provides you the map display in which you can see you person or Vehicle position. Website provides you GUI which can help you to the run software. Off C.G.Road, Ahmedabad, Gujarat, India.